Want to play with Windows 8 metro style apps that are not yet on the Windows Store? Here’s your chance. 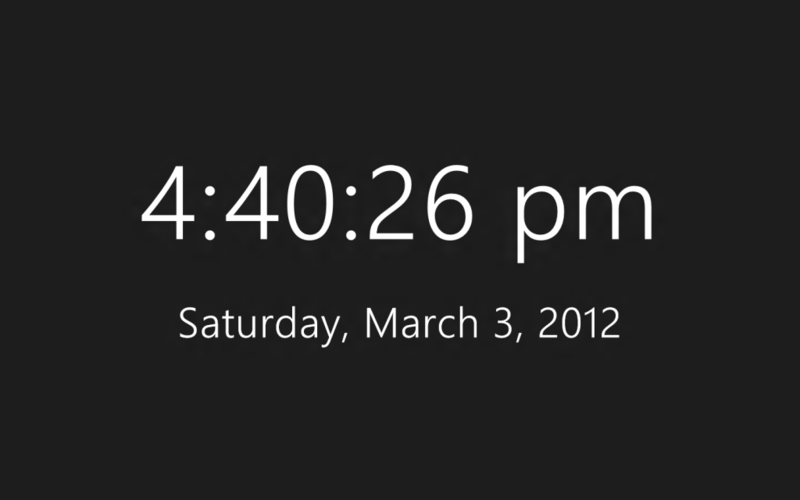 You can download a simple clock app for Windows 8. it is a metro style app, and not a desktop app. It is in its pre-beta stage. You can test this app before it hits the Windows Store. This is one of the most simplest Metro Style app I have ever used. All it does is show you a huge clock and the date. On the final release, the clock will be on the live tile, so basically, it will be a click widget for your start screen. But as of now, the live tile doesn’t work yet. It only shows a static image. When finished, it could potentially look like this! You need to “unlock” your Windows 8 PC before you can install metro style app from outside the Windows Store. If you haven’t done this, go to step 3; otherwise, go to step 7. Create a new metro style project. (Don’t worry, you won’t need to worry about writing code). To do this, open Visual Studio 11, click “File”, then click “New”, then click, “Project”. Visual Studio will then prompt you to developer unlock your PC. Click “I agree”. Then, type in your Microsoft Account Password. Once you get the message that your PC is unlocked, along with the expiry date, you can close Visual Studio. After the expire date, you will need to unlock your PC again if you want to continue using apps from outside the Windows Store. You are done! You will now see clock on your start screen!